I am a Teaching Professor and the Associate Department Head for the Undergraduate Program in the Department of Astronomy & Astrophysics at the Penn State University Park campus in State College, PA. I have a wide variety of interests in teaching, research, and outreach, and have tried to capture many of them here. I teach face-to-face and on-line sections of Astronomy 1: Astronomical Universe for University Park and World Campus students. This is a one-semester survey of astronomy that covers all of astronomy in 15 weeks. I co-authored the “storyline” web version of Astro 1 with my colleagues Jane Charlton, Nahks Tr’Ehnl, Kim Herrmann, and Anand Narayan. I also teach Astro 5: The Sky & Planets for University Park students in face-to-face sections, which is our version of the first half of a two-semester survey of astronomy. I created and teach Astronomy 401: Fundamentals of Planetary Science and Astronomy, which is one of the required capstone courses in the Planetary Science and Astronomy major at Penn State, which began taking students in 2013. I co-created and co-teach, with Julia Plummer, the course Astronomy / Science Education 116: Introduction to Astronomy for Educators. This is an astronomy content course taught in a small group setting for pre-service teachers in the PreK – 4 and Middle Level (grades 4 – 8) CEAED major. I authored and teach the required course Astronomy 801: Planets, Stars, Galaxies, and the Universe for World Campus students enrolled in the on-line Masters of Education in Earth Science program. I co-teach Astronomy 602: Supervised Experience in College Teaching with my colleague Julia Kregenow. We both supervise and mentor all of the graduate teaching assistants in Astronomy & Astrophysics. I have previously taught and authored on-line versions of several other introductory astronomy courses and lab sections, including Astronomy 10: Elementary Astronomy and Astronomy 11: Elementary Astronomy Laboratory. Julia Kregenow and I are working with Stephanie and Tim Slater and the CAPER team on a new lab manual for Astronomy 11 that incorporates labs designed with a backwards faded scaffolding approach. We participate in professional development workshops for faculty interested in adopting these labs in their own astronomy courses. I was a co-Principal Investigator for the recently completed National Science Foundation Earth and Space Science Partnership (ESSP) at Penn State. We worked with a number of school districts across Pennsylvania to improve the quality of instruction and student learning in Earth and Space Science in the middle grades (4 – 9). I am a member and former officer for the Pennsylvania Earth Science Teacher’s Association (PAESTA), and present on astronomy pedagogy at their annual meeting. 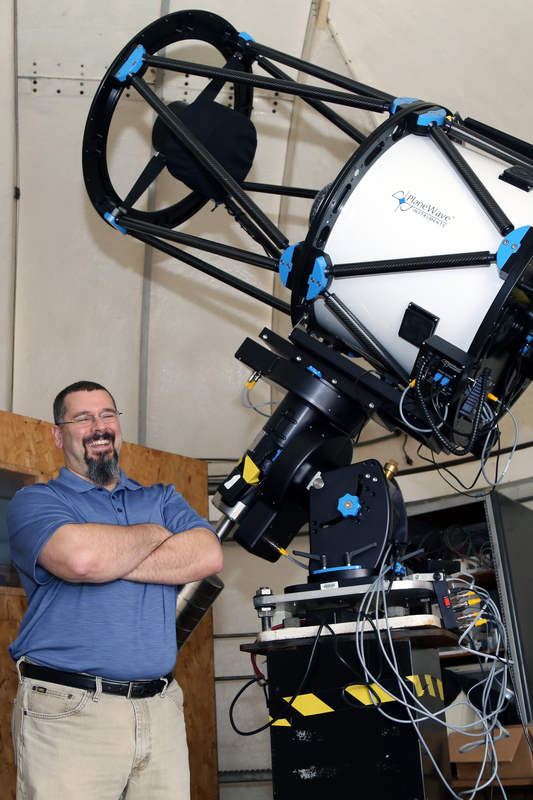 I have been the Director of the Penn State In-Service Workshops in Astronomy since 2002. In a long-term partnership with the Pennsylvania Space Grant Consortium, we have offered 1 – 3 workshops every summer primarily for middle-school and high-school teachers. We have received significant funding from NASA’s Chandra and Hubble Education and Public Outreach programs to support teachers to participate in these workshops. Beginning in 2015, we are working with Central Intermediate Unit #10 to deliver our workshops. I manage, train volunteers, schedule shows, and still occasionally present shows in the Davey Lab Planetarium, which is a 15 foot diameter dome with a Spitz Nova III projector and seating for approximately 30. I have helped to define the vision for a new, significantly larger facility, and we are in the fundraising stage for a state of the art planetarium and immersive visualization theater to be located at the Arboretum at Penn State. Along with my colleague Richard Wade, we have also done some archival research on the previous planetarium at Penn State, housed in Osmond Lab in the 1940s and 1950s. I manage, train volunteers, and lead many of the open house telescope observing programs held at our rooftop observatory on the sixth floor of Davey Lab. I also advise the Penn State Astronomy Club and the Penn State Pulsar Search Collaboratory Club. Along with Jane Charlton, I organize AstroFest, held each July. I serve on the Board of Directors for the Discovery Space of Central Pennsylvania, a science center in downtown State College. I discuss astronomy with Jon Nese on Weather World four times a year. As part of the ESSP astronomy education research group, I am working with Julia Plummer, Scott McDonald, and a group of students to construct a learning progression that is focused on Solar System formation. Planetary Properties, A Systems Perspective, Rubin et al. 2014, Science Scope. Although I am not actively pursuing observational astronomy research at the current time, I have previously studied dwarf galaxies in the Local Group, the globular cluster population of the Milky Way, tidal dwarf galaxies in compact groups, as well as radio galaxies and blazars. We use Attila Danko’s Clear Sky Chart to help us plan for the observing conditions at the observatory on the roof of Davey Lab. I highly recommend it for predicting observing conditions in the State College area.